My name is Angela. My mother suffered a stroke in 2012 which left her incapacitated. As the only daughter and the oldest of three children, looking after my Mom became my responsibility. It didn't matter that I had retired exactly 21 days before that tragic day. My mother's and my life changed drastically and will never be the same. I'm not complaining, because this was the plan for my life given to me by God. 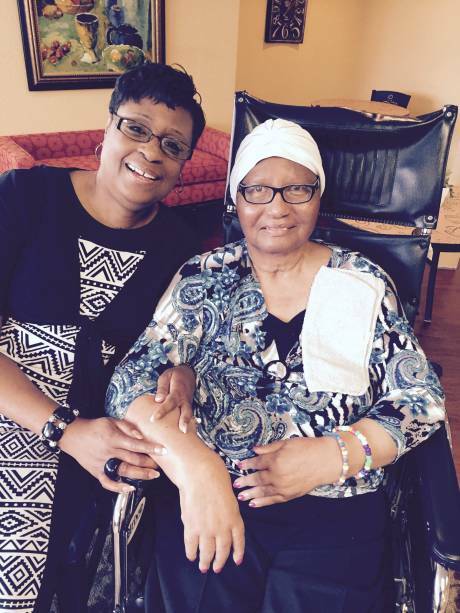 After six months of hospital stay and rehabilitation my mom came home. My days and nights consist of tube feedings, administering medications, bathing, grooming, taking vitals, lifting and turning, entertaining her, running a household, taking care of her business and personal matters. These are tasks that I must do for my mother being that she is "total care" and now has dementia. I've had to return to work on a part time status to help offset expenses, which helped to open the door for an aide to take care of Mom during my absence. The aide has been a GodSend. I am now able to keep my part time job, run errands, have a little me time, attend church occasionally. Being a caregiver is not an easy task, but because of my love for my Mother, I must do my best and carry on, for this too shall pass.